Do you love to dance? Do you want to learn? Not a Scot? Not a problem! Welcome to the Phoenix Branch of the Royal Scottish Country Dance Society (RSCDS)! We hold classes every Tuesday evening from September through May. We have certified instructors teaching a structured course of instruction. Click on "Class Information" to learn more. We also perform at a variety of events and host dancing activities throughout the year, so check out our "Calendar of Events" page. Our emphasis is not only on teaching but also on having fun while you learn. So, if you're looking to discover a wee' bit of your Scottish roots, or just looking for a good time with great social interaction, then maybe Scottish country dancing is for you. Come check us out! Grab your kilt and a partner and kick up your feet. If you don't have either, that's okay! 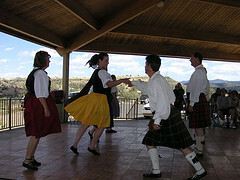 Just come on down, and we have plenty of friendly dancers to help you find that inner Scot! Some Phoenix Branch members with some of our "snow bird" friends joining us at class!